If foaming application is not desired, the included fan-spray-deflector can be used to apply disinfectants, etc. Output: – 6 Litres per minute. 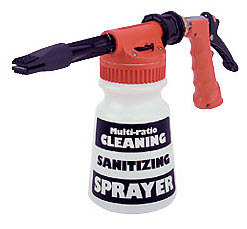 Spray Pattern: – Foaming attachment provides a fan spray, removes for a solid stream. Deflector attachment for non foaming fan spray patterns. Optional longer distance foam wand available. Standard Single Ratio: – 40 ml.of a water weight chemical per Litre of solution sprayed. Caution: Additional attachments or alteration of container or siphon tube are not recommended as it may interfere with proper operation of this unit. 1 oz./gal. 2 oz./gal. 4 oz./gal. 6 oz./gal. 12 oz./gal. 8ml./L. 16ml./L. 31ml./L. 50ml./L. 100ml./L. Cleaning, degreasing or disinfecting when a foam is desired to increase surface contact time.